DT1 FOAM FILTER FOR LARGE SCALE R/C CARS AND TRUCKS. DT1 has teamed up with TGN to bring an exclusive line of foam filters to the Large Scale Industry. 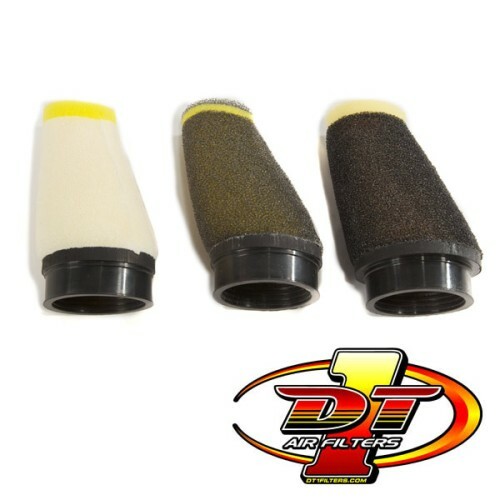 DT1 has quickly become the filter of choice by many profesional teams in all types of motor sports. Including the likes of James Stewart and many others. Dyno tests have show superior performance over other brands of foam filters and most importantly they run cleaner. so you can be proof positive that the filter is working. Our first filter design was made specificly for the HPI baja 5b, SS, 5t, 5sc. But we are positive it will fit many other models. When TGN aproached DT1 we asked them to make the filter as large as possible but making sure to clear the fuel lines from the gas tank. We wanted the max airflow possible but did not want the filter to interfear with the tank or other parts of the car or truck. The slanted design not only allows for clearance of the fuel lines but works great for those with reed case engines where the carb faces up at an angle. High Flow: Made mostly for on-road conditions or very clean enviroments. Regular Flow: Made for standard off-road conditions with a dual layer of foam. Triple Flow: Made for off-road conditions with high levels of dust including sand etc. DT1 Filters are the leader in airfilter technology. DT1 filters are the choice of professionals and amateurs. DT1 filters has over 20 years of experience in building quality filters.